We at love a great Chinese football story when we can find one, unfortunately positive stories and Chinese football tend to be an oxymoron. However, this year Xinjiang football is presenting an absolutely wonderful story that has amazed us. 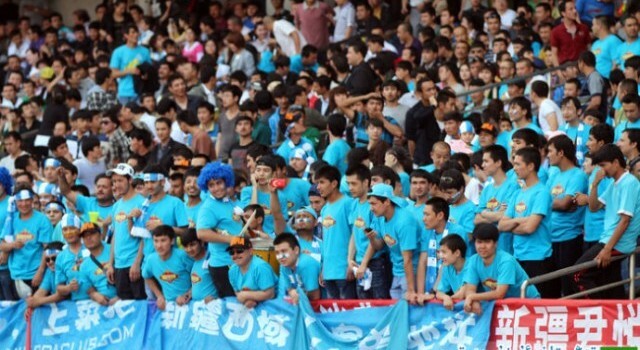 Xinjiang’s clubs is in the China Yi League, or two divisions below the top flight, yet its attendance has been greater than almost every top flight club. Yesterday, in front of a crowd of 45,000, a number larger than any attendance from the Chinese Super League over the weekend and made all the more amazing due to the match being an afternoon start, Xinjiang defeated Beijing Sangao 2-1 to remain undefeated and top of the table. The team, almost entirely Uyghur and graduates of the Song Qingling Foundation football academy, has gained an unbelievable following of Uyghurs from across China. We’ll have a lot more to come on Xinjiang football in the coming weeks, but for now, here are some photos from yesterday’s match showing the real passion of these great fans.